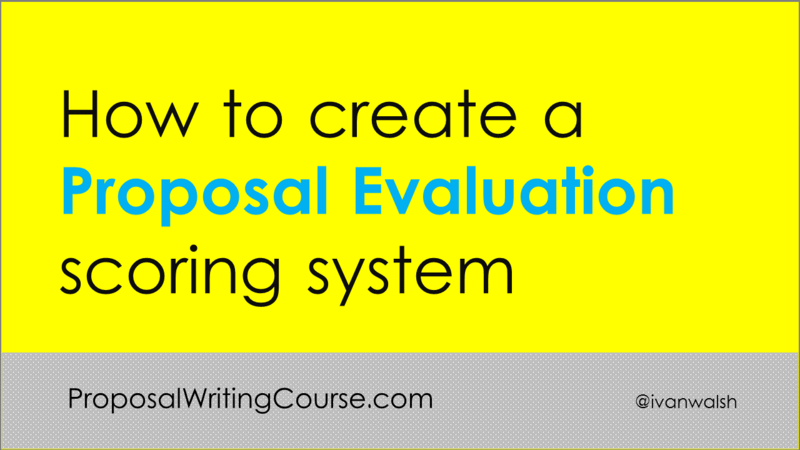 How do you create a scoring system so that business proposals are scored fairly? One way to do this is to develop a scoring system and award points for each part of the bid. You can further refine this by adding ‘weights’ to the scores, i.e. as some parts of the bid are more important that others. Yesterday, we looked at how to setup the proposal assessment team. This team is responsible for evaluating bids, scoring the proposals, and making recommendations. Project Understanding – The prospective contractor must have a deep understanding of what the government agency is trying to achieve and how it wants to achieve the solution. It is critical that the proposal demonstrates an appreciation of the business needs and technical requirements. Quality of the Proposed Solution – The evaluation team will assess the fit between the proposed solution and the requirements of the ITT. This is the main part in the evaluation; bids should present how the system will be implemented at the business level and technical levels, with regard to the preferred technical environment and procedures. Project Management – This covers aspects of the project including scheduling, resource allocation, risk management, issue management, quality assurance, and reporting. Proven Ability – It is essential that prospective contractors have proven track records with the type of technical solution proposed; projects of this size; clients similar to government agency and ideally in the business area. The assessment of capability may require references and referees. Completeness of the Proposal – The least significant (and lowest score), this ensures that areas that fall outside those listed above are evaluated and help score the overall completeness of the bid. In evaluating each bid under these headings, create different forms and templates. The score given to each section will depend to a certain extent on the project under evaluation, its size, the technology involved, the business division and timelines. However as a general guideline it is proposed that the total Phase 1 evaluation is marked out of 1,000 marks, and that the weights of each of the five criteria are chosen to achieve this overall total. In addition, a threshold mark for each criteria should be agreed by the evaluators. It is important to note that should a proposal fail to achieve the threshold mark in any one criteria, then the proposal will fail overall. Make sure to add notes and comments when submitting these marks, i.e. to explain why you awarded these scores. You may also want to reference any perceived risks not addressed in the proposals.